Moscow Patriarch Kyrill I on "gay marriage": In a consumer society no one wants to relinquish his vice: "On the contrary, vice is legalized and legitimized." Moscow (kath.net/KNA) The Moscow Patriarch Kyrill I. is expressed himself hopefully for ecumenical collaboration. The Russian Orthodox Church is in "open dialog with the Roman Catholic Church" and hopes, that this dialog will continue to develop together with the Pope, said the Patriarch in a television interview on Orthodox Easter. Patriarch Kyrill stressed the positive development already begun under Benedict XVI. He hopes that this trend will continue and deepen with Francis. The new Pope is "open to social problems and sensitive to social injustice." Under Benedict XVI. (2005-2013) relations are to have essentially improved between the Russian Orthodox and Roman Catholic Churches, because it was decided, to put aside some "extravagant projects", said the Patriarch with a view to an earlier proposed visit to Moscow. There is a common challenge for both churches. As for so-called gay marriage, Kyrill I said, in the consumer culture no one wants to give up his vices: "On the contrary, vices will be legalized and legitimized." All this leads to a "destruction of personality" and to possible economic, financial, political or ecological crises. The enormous protest in Paris against "gay marriage" had been a "joyous surprise", said the Patriarch. He had not expected such a powerful, religiously motivated protest. (Moscow) He did not do it, in order to meet Western observers, nor to meet together in a discussion with his promoters about the office of the State President of the Russian Federation. But he took some time on the 8th of February to take some "time off" of the business of government to meet with the religious leaders of Russia. 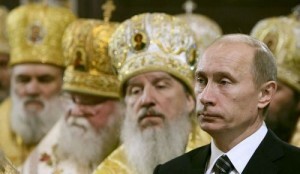 As Vladimir Putin's press speaker said, the religious leaders support his candidacy. The meeting took place officially on the invitation of the Russian Orthodox Patriarch of Moscow, in the DAnilow Monaster, which is the seat of the Patriarch of Moscow. Patriarch Kyrill described the era of Putin as a "wonder". 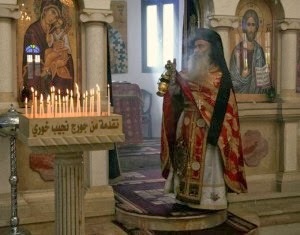 In the Monastery there were gathered with Putin in the congress, the members of the "traditional religions" of Russia, who were held to be the Orthodox, Muslims, Jews and Buddhists, as also the "non-Traditional Religions", which consisted of the Catholics, Armenians and various Christian denominations. Patriarch Kyrill "blessed" the political ambitions of the Russian Prime Minister. Putin is "the candidate, with the greatest view, to translate the office of state through his candidature," said Kyrill. The Moscow Patriarch supported the 2011 demonstrations against election fraud during the parliamentary elections. He is since of the opinion that Putin is the most qualified man on to be at the head of Russia, in order to lead the land, who had been during the last twelve years for the Orthodox Church in Russia, "a wonder". Vladimir Putin was State President from 2000-2008 and has occupied since then the office of Prime Minister. Also Russians Chief Rabbi Berel Lazr supported a third term of office for Putin, as he had opposed the anti-government protests of the last two months. He was quoted as saying; "The fact that the demonstrations always happen on Saturday shows that it has nothing to do with Jewish issues." At the same time support comes from the Muslims from the mouth of the President of the Mufti's Council, Ravil Gainutdin, who said of Putin, "The Muslims know him and trust him. They wish him success." The meeting in Danilow Monstery was critiized by the opposition.